Aeropostale Dress XL/TG. Condition is New with tags. aeropostale dress xs fit and flare blue and white. Shipped with USPS Priority Mail. Material Cotton,Spandex. Swapdotcom Category Kids Apparel > Skirts & Dresses. Type Dress. Color Pink. Discover daily new arrivals in all seasons, sizes and styles that you can't find anywhere else. All details of the product have been included. Swapdotcom Category Kids Apparel > Skirts & Dresses. Material Cotton,Polyester. Type Dress. Color Pink. Discover daily new arrivals in all seasons, sizes and styles that you can't find anywhere else. Type Dress. Material Polyester. Discover daily new arrivals in all seasons, sizes and styles that you can't find anywhere else. Color Blue/Navy. All details of the product have been included. Item Details. Color Orange,Pink,Red. Swapdotcom Category Kids Apparel > Skirts & Dresses. Type Dress. Material Cotton. Discover daily new arrivals in all seasons, sizes and styles that you can't find anywhere else. Style: Sheath. Material: Cotton Blend. Color: Pink. Size: Large. In excellent condition, no stains holes or snags. Color Beige,Blue/Navy,Purple. Type Dress. Discover daily new arrivals in all seasons, sizes and styles that you can't find anywhere else. Material Cotton. All details of the product have been included. Swapdotcom Category Kids Apparel > Skirts & Dresses. Type Dress. Material Cotton. Discover daily new arrivals in all seasons, sizes and styles that you can't find anywhere else. Color Blue/Navy. All details of the product have been included. This is a purple and white floral tank with elastic back and a V neckline. Machine and dryer safe, cool iron if needed. Pre-owned, but in great shape - no stains or tears. Women's Aéropostale dress size small. ONLY WORE ONCE!!! Top of dress has buttons and a gray cord tie. From the elastic waist to bottom of skirt is 16". Material Rayon. Type Dress. Color Purple. Discover daily new arrivals in all seasons, sizes and styles that you can't find anywhere else. All details of the product have been included. Item Details. This white dress has a colorful floral print. 100% Cotton. Machine washable. Gently worn and cared for, we washed on the delicate cycle and hung to dry. We have looked it over carefully and cannot find any stains or tears. Color Purple,Yellow. Type Dress. Material Polyester. Discover daily new arrivals in all seasons, sizes and styles that you can't find anywhere else. All details of the product have been included. Item Details. Chest: 28" w/out stretching. Waist: 24". Smoke free. Material Cotton,Modal. Discover daily new arrivals in all seasons, sizes and styles that you can't find anywhere else. Type Dress. Color Black. All details of the product have been included. Item Details. Floral Dress. Swapdotcom Category Kids Apparel > Skirts & Dresses. Type Dress. Material Cotton. Discover daily new arrivals in all seasons, sizes and styles that you can't find anywhere else. All details of the product have been included. Color Blue/Navy,Turquoise. Type Dress. Discover daily new arrivals in all seasons, sizes and styles that you can't find anywhere else. Material Cotton. All details of the product have been included. Order a Clean Out Bag and refresh your wardrobe. Earn a little cash or credit. Slip dress. 29" Length. Light Blue. Apparel Conversion Chart. Japan21 21.5 22 22.5 23 23.5 24 24.5 25 25.5 26 26.5 27 27.5 28. 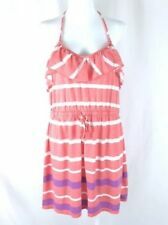 Aeropostale Dress Juniors Pink & Blue print Summer Dress size Small. Condition is Pre-owned. Shipped with USPS First Class Package. Aeropostale Women’s Black Dress Size XS Textured Design New without tags. Never worn. Super cute! If you are buying more than one item, please contact us (prior to payment) if you would like a combined shipping quote. Combined shipping prices are on a case by case basis. It just depends on the total weight of what you are buying and where it is going. Items come from a clean, pet-free, smoke-free home. Thanks for visiting! Check out my other listings. Swapdotcom Category Kids Apparel > Skirts & Dresses. Type Dress. Material Cotton. Color Green. Discover daily new arrivals in all seasons, sizes and styles that you can't find anywhere else. All details of the product have been included. Neon Green with white lace dress! Cute and casual dress from Aeropostale - navy blue and white in a floral fleur de lis pattern, v-neck with tie in back, stretch waist, flowy, comfortable. Extra Mini. Care-Machine Wash, Tumble Dry. Fabric Content: 95%Cotton 5%Spandex. Comfy body con dress. Very casual, and so comfy that it can even be worn at home. Double lined!! Bought but never worn = brand new. From the back of the dress to the hem is 23". This dress is fun, light-hearted, perfect for warm weather. It can be dressed up or down. Swapdotcom Category Kids Apparel > Skirts & Dresses. Color Black,Pink,White. Type Dress. Discover daily new arrivals in all seasons, sizes and styles that you can't find anywhere else. Material Polyester. Color White,Multi Colored. Material Cotton,Spandex. Discover daily new arrivals in all seasons, sizes and styles that you can't find anywhere else. Type Dress. All details of the product have been included. 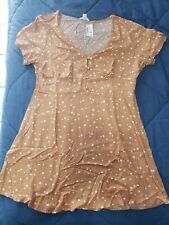 Up for auction is a NWOT aeropostale dress size L. I am cleaning my closets of all unused items please see my other listings. Thanks for looking! Never been worn, very cute and soft. Size: Small P. If there are any flaws they will be pointed out in pictures. New without tags never worn. Aeropostale XS sleeveless dress. Style : Line A .